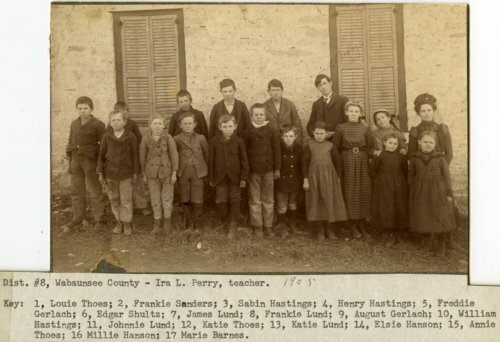 Photograph of students and their teacher from Wabaunsee County School District No. 8 standing beside the school. The teacher has been identified as Ira L. Perry. The students have been identified as Louie Thoes, Frankie Sanders, Sabin Hastings, Henry Hastings, Freddie Gerlach, Edgar Shultz, James Lund, Frankie Lund, August Gerlach, William Hastings, Johnnie Lund, Katie Thoes, Katie Lund, Elsie Hanson, Annie Thoes, Millie Hanson, and Marie Barnes.